Happy Spring Break from TPO! Today some exciting updates have come from Six Flags Great Adventure, the World's Largest Theme Park, in Jackson, NJ. Their new 2013 attraction is well underway for a Memorial Day Weekend, which is a little over 2 months away! 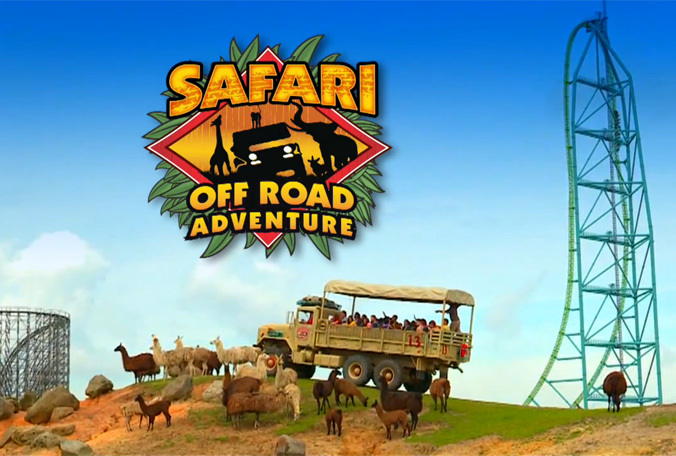 Accessible through the Frontier Adventures section of the park, a fleet of 17 All Terrain Trucks will drive 30 passenger at a time along the 350 acre African Wildlife Preserve within the park's property. With over 1,200 animals from 6 different continents, you'd think your in Africa if it wasn't for the towering coasters in the distance! The experience will be split in half, by having a pit stop in the middle, in the form of Camp Aventura. Here guests will unload and be able to have a hands-on experience with the animals, including hand-feeding, up close encounters, and even a zip line over the animals for an additional fee. This attraction is a plus for everyone! Previously, the preserve was a drive-thru experience where guests paid an additional admission fee and drove their own vehicles through. Now, not only is this experience more personalized and memorable, but it's included with regular Theme Park Admission (Score)! TPO will have full coverage of the new attraction from Media Day this May at the opening. That's all for now! Make Sure to "Like" us on Facebook to gain access to Exclusive Content and Giveaways! www.Facebook.com/ThemeParkOverload My name's Nicholous, and Thanks for Reading!